During its flight, the Galileo spacecraft returned images of the Earth and Moon. 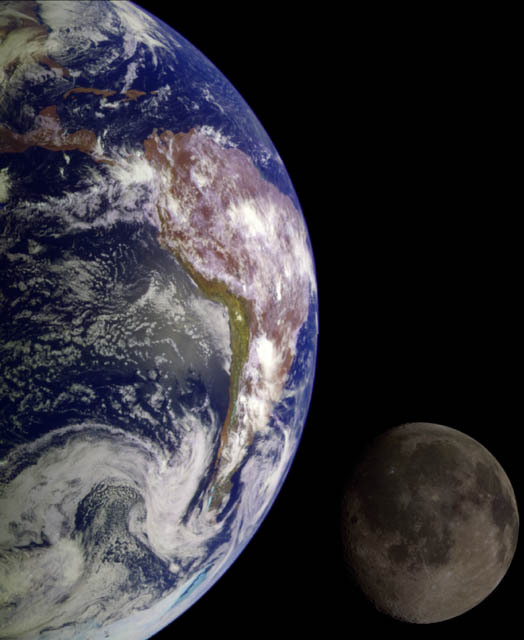 Separate images of the Earth and Moon were combined to generate this view. The Galileo spacecraft took the images in 1992 on its way to explore the Jupiter system in 1995-97. The image shows a partial view of the Earth centered on the Pacific Ocean about latitude 20 degrees south. The west coast of South America can be observed as well as the Caribbean; swirling white cloud patterns indicate storms in the southeast Pacific. The distinct bright ray crater at the bottom of the Moon is the Tycho impact basin. The lunar dark areas are lava rock filled impact basins. This picture contains same scale and relative color/albedo images of the Earth and Moon. False colors via use of the 1-micron filter as red, 727-nm filter as green, and violet filter as blue.